My blogging friend, Ann, is a wonderful seamstress and she has been working like crazy to fill her new etsy shop. Look at this cute fall design. She has even started making stockings.. I love this fabric. Ann, is one of my new sponsors and she is being very generous and offering one of my readers a $30 shopping spree in her etsy shop. Ann works during the week, but has been sewing her little fingers off when she is home trying to get her shop stocked so more will be getting added. 1. 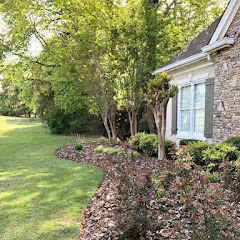 Become a follower of my blog through google connect if you aren't already and leave a comment telling me so or that you already are a follower. 2. Check out her Etsy shop and come back and tell me in a comment what you would buy with the $30. 3. Share this giveaway info on your blog, facebook or twitter and come back and leave another comment. Please included an email address if you don't have a blog. This giveaway will be open through Monday and the winner announced on Tuesday. 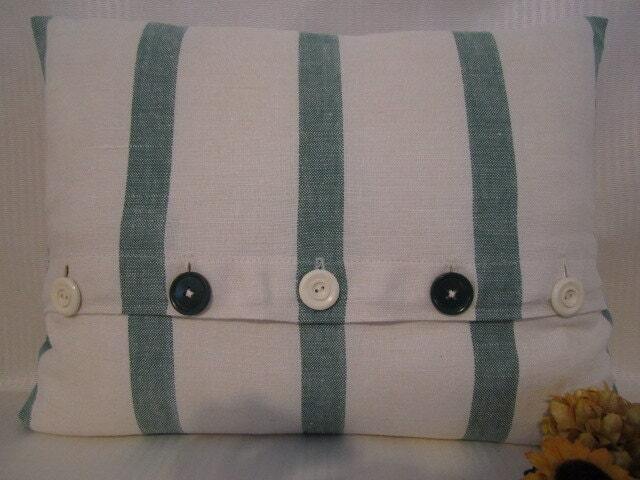 I love the 15 x 15 Pillow Cover made from Vintage Linen towel Vintage button closure Navy and Creamy White! I love the buttons on it! I would HAVE to use my 30.00 for that cute Halloween pillow. Darling! Great giveaway Kim, I'm a follower of your wonderful blog! I am a follower! Love your blog. I would get the red check table runner! It would look perfect in my dining room. Great giveaway! 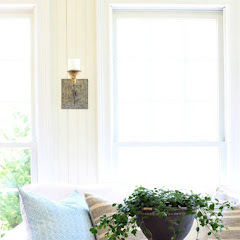 If I had to choose from Ann's wonderful goodies, It would be the Windowpane pillow cover. I am indeed a follower.Thanks for sharing. I am already a follower, Kim! I think I'd get the pillow cover in black, gray and cream. She's added a lot more since she first announced her shop. I see she's got Christmas stuff, too! 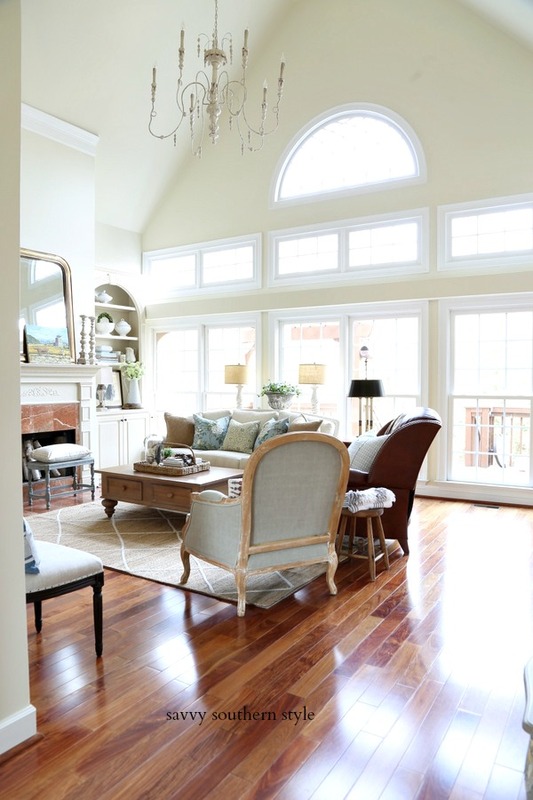 I would pick the cushion made from the Belgian linen towel - so pretty! I am already a follower!! love the blog! Loving the Waverly pillow cover you featured, but they are ALL beautiful! Thanks for such a great giveaway! I love the vintage blue linen pillow cover..beautiful pillows! I follow through Google connect. I love the grey polka dot pillow. So many cute things. Love the Autumn Fall Pillow Cover Decorated with Dried Flowers and Twine. It would be fun to change out the flowers for a scarecrow or pumpkin on a dowel, etc. Fun! Thank you for this giveaway, Kim. You probably need my email since I am blogless. I am a follower of both you and Ann! What a great giveaway! I would buy the red checked table runner!! Any of the 20X20 pillow floral pillow covers. Congratulations to Ann on her accomplishments. She does very nice work! I love the table runner very nice.I am a follower! Hi Kim, Thanks to you and Ann for this great giveaway. Of course I follow both of your blogs. Kim, I would buy the red checked table runner! Adding the giveaway to my sidebar! Oh I just love the red and white check pillow. I need some for my couch as I type. Thanks for the chance. Thanks for this awesome giveaway. I love Ann's stuff. I am already a very happy follower. Mmmm,...I love all of those stockings, but one of the red tickings would be my favourite. Thanks again for the awesome giveaway. If I had to choose just one thing from Ann's shop right now it would be the fall autumn pillow cover. Love it! Ann is so smart and talented! I would grab that table runner in a heartbeat! Cute! I would buy the throw pillow with the vintage button closure. LOVE. I would 2 of these babies! Well of COURSE I am a Follower! I visited Ann's shop -- love her style. I would choose the vintage linen pillow cover in navy and white -- the checked -- for our beach house; it would be perfect! I'm already a follower, but was wondering if you're thinking of linking your blog to facebook? She doesn't have them in her shop yet, but what I really love are her new porch pillows. I think if she adds them, her shop will definitely be a hit! They were gorgeous! I love that Autumn Fall pillow! She really does have some darling things. I will join in on the fun!! Pick me!!! Thanks for the giveaway kim!! I am already a follower.. 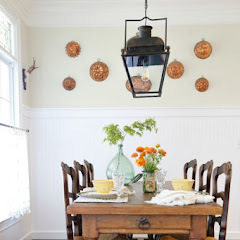 I would so love the Red checked homespun table runner... gorgeous!! 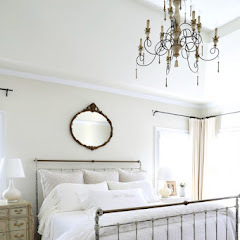 All her pillows are amazing and I love the button closure one made with the vintage linen! Gorgeous! I've been a happy follower for a while! I also follow Ann's blog, I'd love to win the vintage pillow made from vintage runner! I am already a loyal follower of your blog. Love it. I love the Vintage Linen Pillow with the vintage buttons! It would be really hard to choose though! I am a follower of your & Ann's. She has done some great projects. I love the vintage towel pillow (Navy & creamy white) that is 15x15 @ $20. I'm a GFC follower! great giveaway! I follow both of you and I would love to have the - Pillow Cover Vintage Linen 14 x 17 Down Insert Included Cream Blue! would love to win this! I'm a follower! The fall pillow is divine. Richard from My Old Historic House. I follow your lovely blog daily, but just became an official follower. The fall pillow would just love to come to my house. Thanks for the great giveaway opportunity. OH WOW I missed this the first time around here. I just went on Ann's site the other day. I loved the Fall pillow with the pocket full of fall sprigs. 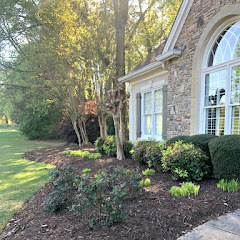 She does wonderful work! Thanks for the chance! You know I'm a happy follower of your blog. 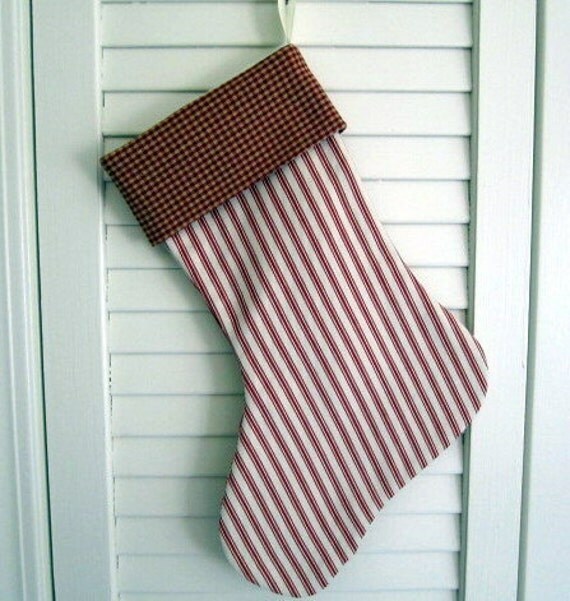 I've visited Ann's shop last week, but she didn't have those adorable Christmas stockings yet. If I would be so lucky, I'd choose that red table runner. Happy to be a daily follower! Thanks for the opportunity. 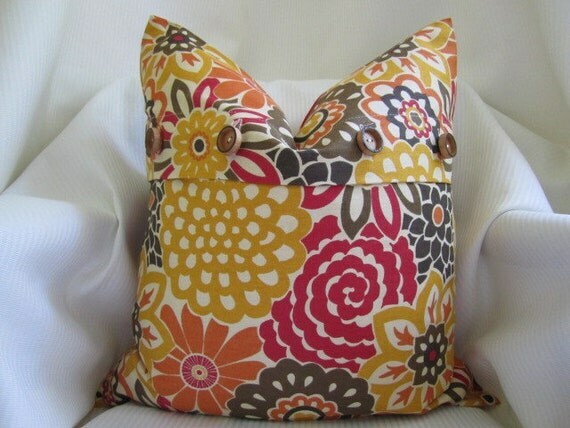 Know doubt about it...If I had an extra $30 to spend at Etsy it would have to go for the "fun floret" pillow. Perfect colors! I visited the etsy shop. I would choose one of the flowered pillow covers. I love the waverly fabrics she chose! I'm a follower of Savvy Southern Style and love it! I'm crazy about the Waverly pillow cover! I follow both you and Ann! I appreciate the opportunity to be included! I love the red-checked runner! Isn't it cute? I'm delighted to put post the giveaway on my sidebar! I would LOVE to win this great giveawy. I'm a follower..but I love the wool felt Halloween pillow! O, I would buy the creme and blue linen pillow...beautiful.. I am follower, and have already checked out Ann' shop - very talented lady. I would pick the striped one with buttons. Every home needs a black crow pillow for the Fall. So cute!! I love the 14x17 vintage linen pillow! Hi KIm, you know I am a follower. Great giveaway. I love the red plaid pillow cover and the red check table runner. Hard decision! Well you know us gals are followers, admirers, stalkers..just kidding. ;) Love ya Kim! Kim, Love your header. I visited Ann's Etsy shop and I love the Country French Runner with the ruffle. It would be perfect for my kitchen table at Christmas. I hope I get lucky! Thanks for the chance in your giveaway. I would definitely love to have the IKEA Windowpane fabric throw pillow cover. Love it and I'm just starting to put together a craft/sewing room from my newly married daughters old bedroom. The pillow would be perfect for me to cozy up in a chair while I wonder what the heck I'm going to make cuz I'm not a good seamstress. That fall pillow with the black check will be perfect with my new sette...gotta have it..hope I win! Already a follower. Would love to win. I need a new tablerunner. Would love to win one. I'm a follower and a fan. I love the pillow made from a vintage linen runner. What a talented girl, that Ann is. I'm absolutely in love with that red and cream runner! I love the Waverly pillows. Beautiful! I love your new blog banner. It's gorgeous! Your blog is amazing. I am a faithful follower ! I'm a follower and would love the Autumn Fall Pillow Cover! follow you on GFC! Thanks so much for this weekend giveaway! if I win I would definitely choose the Pillow Cover with Vintage Linen & buttons, 14 x 17 Down Insert Included. Cream & Blue color. Its beautiful... what a great job she did on this pillow! I didn't know that Ann had an Etsy shop! I would choose the red checkered table runner. It would make my kitchen curtains perfectly. Kim, Ann does beautiul work. Thank you for the generous giveaway. Wow, I am a follower and have fallen in love with the two floral cushions in your giveaway!! They make such a statement!! I've been a follower for quite awhile now. I would choose the cute fall pillow. Great addition to my autumn decor. I'm a follower - officially now, have been an unofficial one for a while, cause I love your blog! Those vintage linen pillow covers, with vintage buttons are really the cutest! I would love to have them on my day bed. I love the black, gray, & cream scroll pillow, and the waverly print pillow too! I posted about your awesome blog and this giveaway on my blog! Oh my, I like them all. Maybe the black, gray & cream with the scroll design...they are all so pretty! I already follow you. If I win the $30, I would buy the wool felt appliqued halloween fall pillow cover. It is very cute. I'm a librarian and the kids at my school will love it on the couch. I'm a blog follower of yours and love it! Love the autumn/Halloween pillows! Great giveaway! Thank you! Love her stuff. Love your site. So glad I ran across your blog...I love it! The giveaway is good too! I am now a follower, giveaway or not! forgot to mention that i would love to have the gray and black scroll pillow..if i have to choose just one! i have included your giveaway on my blog too! thanks again! I am an AVID follower of your already, and would LOVE to be able to purchase the: Pillow Cover handmade from a vintage linen table runner. Vintage button closure. Cream with two-tone blue edges. THANKS SO MUCH! I love your fall pictures too! I would buy the Halloween pillow. I love your blog!! What a great giveaway....so many choices to choose from! I'm a faithful follower!!! Looks like a great giveaway! 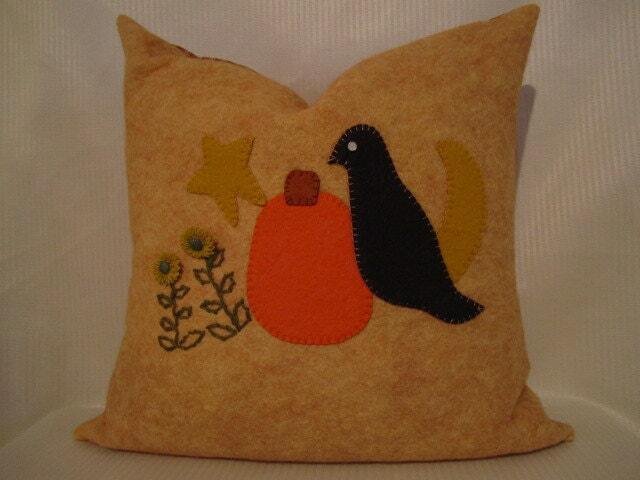 All of Ann's pillows and stockings are darling but I love the wool felt one with the pumpkin and bird...for Halloweeen. So cute. Of course, I'm a follower. I am a follower of your blog and have visited often. Your posts are inspiring. My favorite items are the fall pillow covers, I like the felt one too. I really like all of the vintage-look items...especially the pillows! I love the fall felted pillow.